Wings is a supporter of the Bears Ears Prayer Run Alliance in partnership with Utah Diné Bikéyah and The Seventh Generation Fund for Indigenous Peoples. 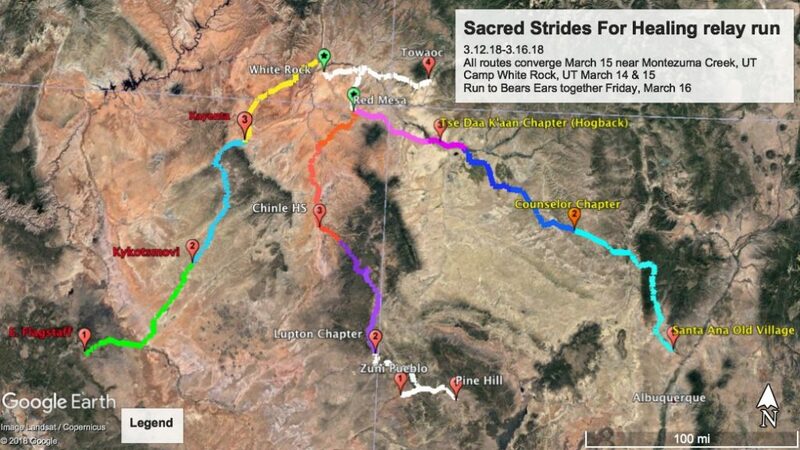 This page is to help prospective participants learn more about the Sacred Strides For Healing prayer run and gathering that will take place March 12-17th from various Tribal homelands across the southwest. 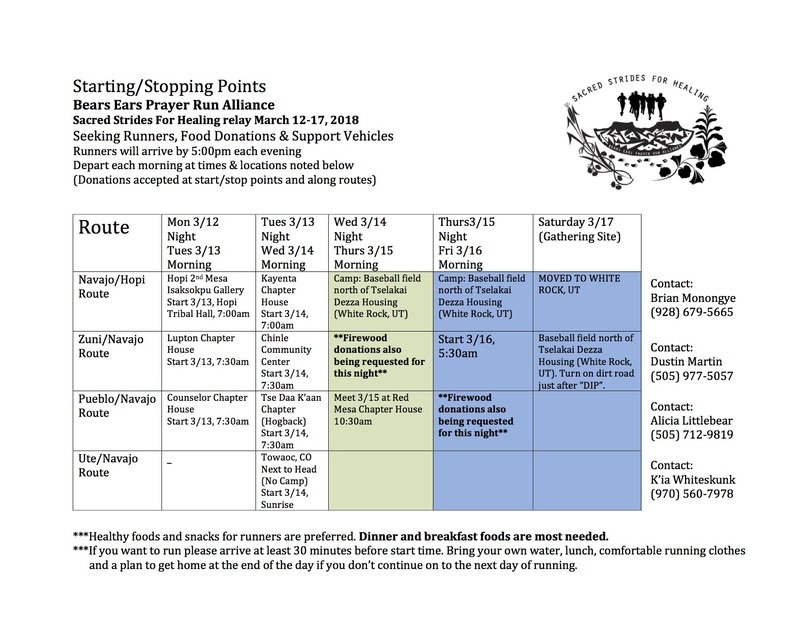 On the evening of Thursday, March 15, the above routes will converge in White Rock, UT. Participants are welcome to camp on the land of a local supporter. On Friday, March 16 the runners from all routes will cover the distance from White Rock to a gathering site on Ute Mountain Ute Land in Allen Canyon. Those that wish to travel to the site to pray with the runners should arrive at the campsite in White Rock, UT by 5:30am on Friday morning. Runners will receive prayers from a White Rock resident before departing to run along Comb Ridge. DUE TO FORECASTED WEATHER AND CONCERN FOR THE SAFETY OF PARTICIPANTS, THE GATHERING ON SATURDAY (3/17) WILL TAKE PLACE IN WHITE ROCK, UT at the campsite used by participants on Wednesday and Thursday nights. Each morning, teams of runners will be split amongst available support vehicles and assigned 10-30 mile sections along pre-determined routes by the route leader. This is to help ensure we are able to cover the entire distance safely and effectively. Those that cannot arrive at a starting point at the beginning of the day may “jump in” with other runners along the route but should expect to be assigned a section by the route leader if they have a support vehicle and there are enough runners to utilize it. Unfortunately we cannot guarantee transportation back to the start point will be available every day. Please plan ahead to make sure you do not get “stuck” with the relay runners for longer than you might have hoped. -Reusable water bottle or hydration pack. -Comfortable, reliable shoes to walk/run in. -A plan for getting home after the run/gathering is over if you do not have a vehicle. The gathering site will only sustain our short presence. Ute Mountain Ute officials will remove any participants that linger beyond late morning of Sunday, March 18. -A light wind/moisture resistant jacket to run in in case of bad weather. -Light gloves to run in. -Snacks and fuel to keep your self and your relay team members moving. -Bright color clothing and/or a safety vest to wear when running on the road. -A foldable camp chair if you plan to attend the gathering. -Good intentions and prayerful spirits. This run is intended to help our people and Mother Earth heal from years of intense trauma. Please do not counteract this effort by bringing forcing your fellow route runners to carry your baggage. UPDATE: DUE TO FORECASTED WEATHER AND CONCERN FOR THE SAFETY OF PARTICIPANTS, THE GATHERING ON SATURDAY (3/17) WILL TAKE PLACE IN WHITE ROCK. Runners will still depart the campsite in White Rock on Friday, March 16th at 5:30am to deliver prayers to the original camp site. Be sure to bring a camp chair if you would like to attend the gathering. Meals will be provided but any food you may want to contribute will be enjoyed by the group. Throughout the day the gathering agenda will help participants understand more about the protection of ancestral lands by reviewing the Antiquities Act, the recent history of the Bears Ears Region, international Indigenous law. We will also review and listen to testimonies of relay participants. We will finish by asking participants to work together in small groups to create language and testimonies for Tribal leaders to use as a resource as they fight the reduction of protected lands. The gathering is intended to bring participants together in thoughtful prayer for the land of our ancestors. Intoxicated personalities will not be tolerated. If you would like to participate in the Sacred Strides For Healing relay run for multiple days, please be prepared to “rough it” by bringing your own tent, sleeping bag, pad and cold/wet weather gear. These items will be available in very limited quantities to check-out from event organizers. However, please do not rely on this small bank of gear to get you through the week. Especially when we run into southern Utah, expect temperatures to fluctuate drastically throughout the day. Cold weather sleeping gear is an absolute necessity. In some cases we have arranged to have a local Chapter House or community center opened for us to sleep at in-between relay days. Please check the details of each route before counting on an indoor space to sleep. Most of these facilities may have showers and bathrooms, but you will need to provide your own towel and toiletries. Rain or shine, we will cover the routes we have outlined. Your foresight, resilience and positive attitudes are much appreciated for this group effort. As we attempt to cover these long distances on foot, there will be very little patience for those that aren’t logging miles because they are ill-prepared physically, mentally or materially. If you would like to make a monetary contribution to the Bears Ears Prayer Run Alliance and the Sacred Strides For Healing run, please visit the donation portal set up by The Seventh Generation Fund for Indigenous Peoples HERE or click on the logo above. Donations are tax deductible and deeply appreciated. Apart from RUNNERS, the Bears Ears Prayer Run Alliance is seeking: food for runners, sleeping bags, tents, support vehicles, running shoes/gear, and first aid. You can also contact BEPRA organizer, Dustin Martin, directly at (505) 977 5057 if you have any of these items to give. Thank you. We are a group of concerned citizens trying to honor the foresight and effort our Tribal leaders exhibited by creating The Bears Ears Inter-Tribal Coalition in 2015. Though the initial vision and protections of “Bears Ears National Monument” are now in danger, the land and its resources will forever remain a part of our heritage. We will continually return to the land on foot from our respective homelands to pray for its future and foster appreciation for our ancestral teachings. 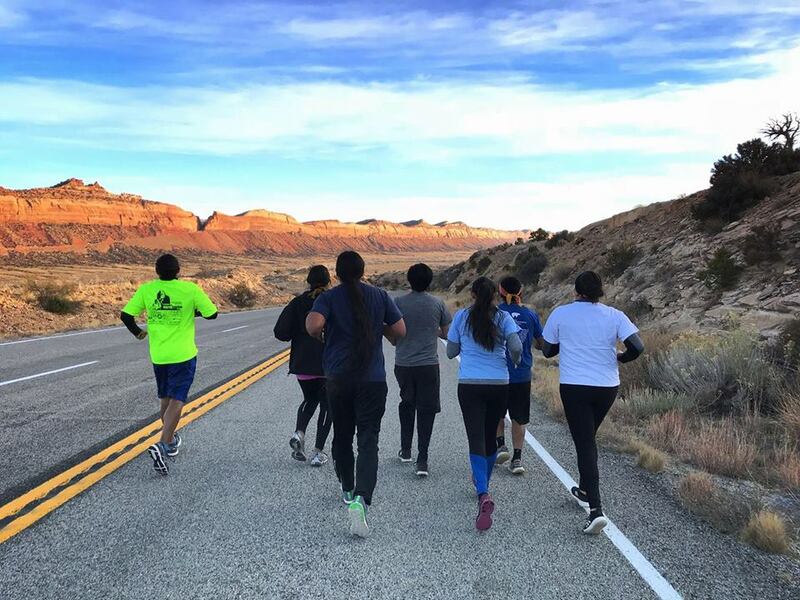 The Bears Ears Prayer Run Alliance was formed in early 2018 after organizers participated in the “Three Sisters Prayer Run” from Flagstaff to Bears Ears during the final days of 2017. The organizers are members of the participating Tribes. Through continued collaboration with groups like Utah Diné Bikéyah, Wings of America and The Seventh Generation Fund for Indigenous Peoples, we would like to create opportunities for Native youth to explore and know their ancestral homelands.